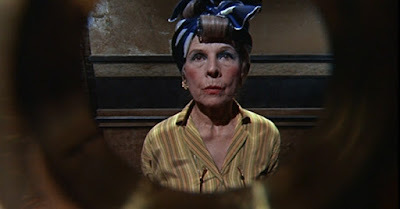 Ruth Gordon in Rosemary's Baby. Just another reason to love this collection, and this movie, and hate the fact that the director of TRANSFORMERS is doing a remake. He should totes get together with the, for lack of more perfect word, dumbass remaking Bonnie & Clyde and they can have a party where they plot to ruin more perfect movies. Their ladyfriends Megan Fox and Hillary Duff will be there as well, and they will offer to play the Edies in their mentors' new project, a remake of Grey Gardens.